Practice Quality Coordinator; Kerri Lanum, Clinical Informatics Specialist with ILHITREC (2017). Riverside Healthcare’s participation in ILHITREC’s TCPI program is providing the medical group with valuable guidance to successfully implement quality improvement plans central to the new value-based payment model. The Centers for Medicare & Medicaid Services (CMS) and many private payers are now reimbursing providers based on patient health outcomes as opposed to a fee for service model. 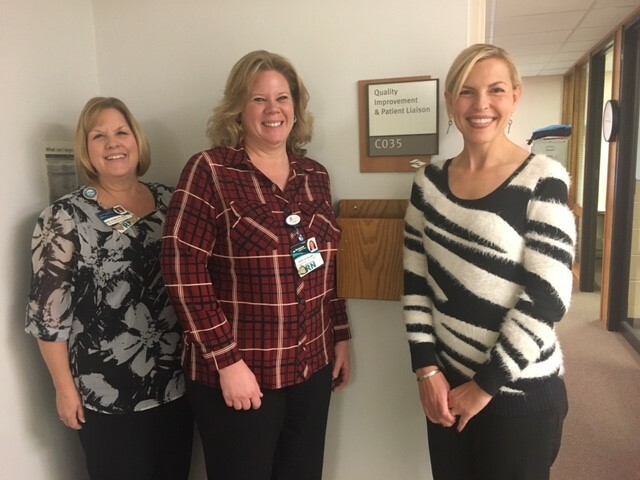 The Illinois Health Information Technology Regional Extension Center (ILHITREC), based at Northern Illinois University in DeKalb, IL, is part of a collaborative network selected to participate in the Transforming Clinical Practice Initiative, initiated in 2015 by CMS. ILHITREC’s TCPI program is helping providers throughout Illinois operate successfully in the new value-based healthcare payment model. “The TCPI program has greatly benefited our medical group. The structured approach and on-site support from ILHITREC have been vital to transforming our practice and staying current with payer guidelines,” said Deena Layton, Physician Practice Quality Coordinator at Riverside Healthcare. The medical group employs more than 140 providers and has over 40 office locations throughout Kankakee, Will, Grundy and Iroquois counties. The first challenge undertaken by Riverside Medical was to “Improve performance on Quality Measure CMS 165: Controlling High Blood Pressure by Improving from 66% to 72%.” The medical group implemented a quality improvement plan that measured patient improvement at six-week and 14-week intervals. To monitor the program’s effectiveness for this Quality Measure, IHITREC worked with Riverside Medical to track challenges and solutions. As Riverside Medical considered potential challenges, it formulated innovative solutions including implementing an online refresher course about how to properly take a patient’s blood pressure for all MA/Care tech positions. The group also took inventory of blood pressure equipment at all of its clinics to ensure it was up-to-date. As part of the plan, during appointment confirmation calls, patients were reminded to take their medications before arriving for appointments. Upon arrival for appointments, technicians took blood pressure toward the end of the check-in process. If a patient’s blood pressure was above 140/90, or above a level of concern to the physician, the patient’s blood pressure would be re-taken. During their visits, patients were encouraged to document their blood pressure readings at home by use of a log. “After six weeks of implementing the blood pressure control measure, results improved 1%; however after 14 weeks, there was a 10% improvement, surpassing our goal of 72%, up to 76%. Currently this measure consistently is at 76-77%,” said Layton. She added that Riverside Medical is striving to continue to improve the quality of care for patients at all of its facilities and is looking forward to being successful in the new quality payment programs in the future. “I think the biggest lesson we learned through this experience is to be patient and have confidence that your strategies will work,” she said. “One of the most important things for quality improvement is digging down to the details of the process. This can be time-consuming, but is necessary to truly discover the root cause of the issue. For this example, running reports and looking up the patient’s charts that were not in the numerator and determining why and identifying trends was key in developing our strategies,” she said. The Illinois Health Information Technology Regional Extension Center (ILHITREC) based at Northern Illinois University in DeKalb, IL, serves healthcare providers throughout Illinois. It is part of a collaborative network selected to participate in TCPI, the Transforming Clinical Practice Initiative, initiated by CMS. ILHITREC is part of a TCPI Grant collaborative called Great Lakes Practice Transformation Network (GLPTN) based at Indiana University that received grant funds to support clinicians across Illinois, Indiana and Michigan. The TCPI work builds on eight years of work by ILHITREC assisting providers with the adoption and use of Electronic Health Records. By 2019, 85% of health service reimbursements by CMS will be granted on value-based care. Tracking for those reimbursements starts this year. More than 15,000 clinicians across four states have joined the GLPTN to leverage direct technical assistance, resources and tools to further their quality improvement efforts and prepare for MACRA. For more details about ILHITREC or the TCPI program, visit www.ILHITREC.org.